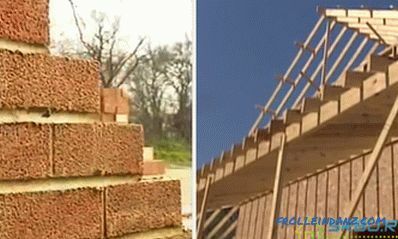 Before starting construction work, many people at first calculate and prepare material. This is correct and commendable. But at this stage different questions arise, one of which is what sand is needed for the foundation. Selection of sand should be given special attention, as it is one of the main and important components used in the mixing of concrete. And your future foundation, foundation depends on the quality of the concrete mix. 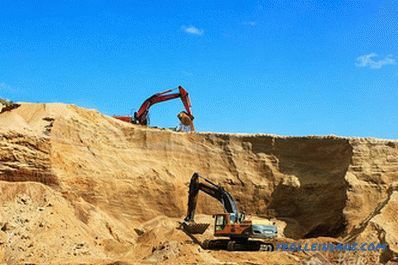 Taking into account the fact that the market has a large selection of different sand, both natural and artificially obtained, it is important to choose the most suitable one for these jobs. In this article we will describe how to make a choice. Anyone who does not versed in the construction business and its nuances, it can be guessed that for the foundation it is necessary to choose pure sand. Initially, different organic elements may be present in the sand, such as grass, branches, and so on. Such sand is not suitable for work, but it can be easily cleaned. Maybe you have often seen workers sifting sand, cleaning it of unwanted elements. But if we talk about such impurities as clay, lime, and other similar ones, then we cannot do it by simple sifting. It is more difficult to clean this sand, so when buying you need to immediately pay attention to it. The presence of clay in the sand should not exceed 5% of the total mass, especially if we talk about the base solution. Otherwise, the future structure of reliability will not differ, it will shrink, and this will lead to cracks. Before buying it is important to check how clean the sand is. For verification, you can use the simple method. You will need a clear bottle, be it glass or plastic. 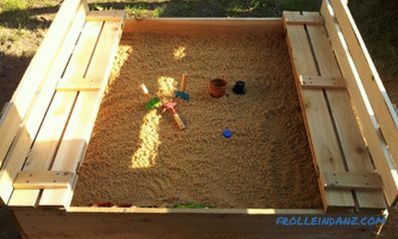 In it you need to fill the sand to 1/3 and fill with water to half. 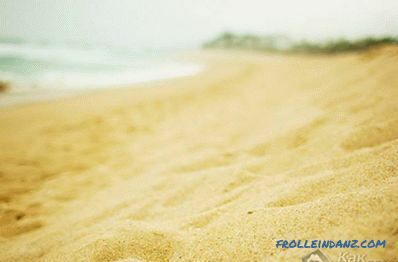 Next, shake the bottle vigorously so that the sand mixes with water and becomes completely wet. After that, put it and wait 5-10 minutes. If the water has become dirty, this sand will not be suitable for the foundation. If a foreign substance has formed on the surface, with a layer of more than 5 mm, such sand cannot be taken. 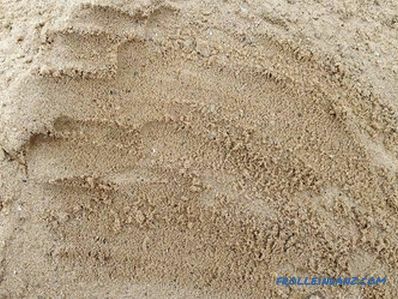 Let's look at what types of sand are, how they differ and what kind of sand is better to acquire for the foundation. The very name of the river sand suggests that it is mined from the river bottom. This is a versatile material, as it contains fractions of different sizes - from 1.6 mm to 2.2 mm. Because of this, it is used not only to fill the foundation, but also for various construction purposes. 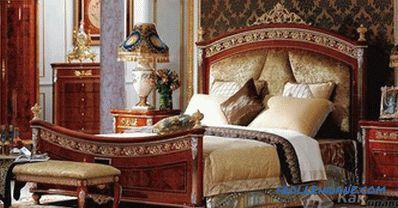 To call the main advantage of river sand can be its natural purity and uniformity. Clay, particles of vegetation and other impurities in it are very small. This sand is ideal for foundations. Only here its price is high enough. 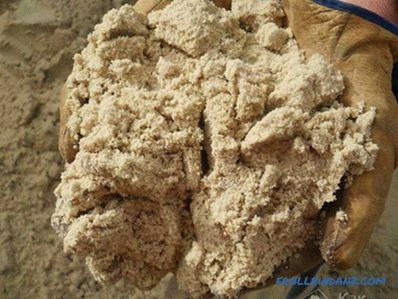 Sea sand is extracted from the bottom of the sea, after which it is cleaned of limestone and other impurities . The difference of this sand is its grain, which is about 1 mm. This granule size allows it to be used for the construction of reinforced concrete structures. 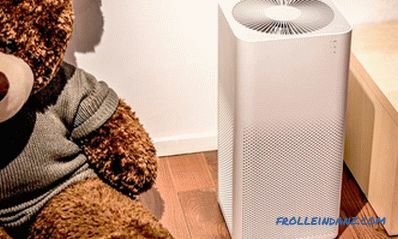 It can be called clean enough, as it is cleaned, screened and washed before being sold. But you have to pay for quality, so sea sand is the most expensive. The quarry sand is mined by opencast from the quarry. If you compare it with the river and sea sands - this is the worst option. And it is not surprising, since there are a lot of impurities in its composition - clay, vegetation and crushed stone. Because of this, the price of such sand is the lowest and is suitable for roughing work at the initial stage of construction. In order to unambiguously determine which sand is better suited for concrete, it is important to consider other features. Some masters advise to buy career sand, which is cheaper, referring to the fact that it will not affect the quality of the base of the house. Others say that the quality is above the price, so you need to choose expensive sand, which will ensure the reliability of the foundation on which you can not save. 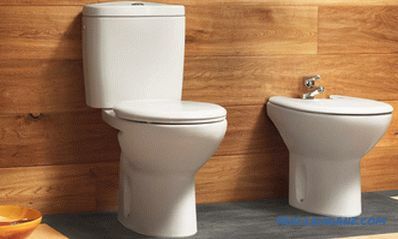 Anyway, it is necessary to consider other features and criteria that will help determine the choice. As mentioned above, sand should be clean If it has vegetation or branches - it is not scary, they can be weed out. But clay, silt, gravel and other particles can lead to a decrease in the quality of the concrete solution. The presence of clay should not exceed 5%. The presence of gravel as a percentage of the total mass should not be more than 5%, and the size of particles - more than 10-12 mm.If the size of the gravel ranges from 5 mm to 10 mm, then a larger percentage is allowed - up to 10% of the total mass. 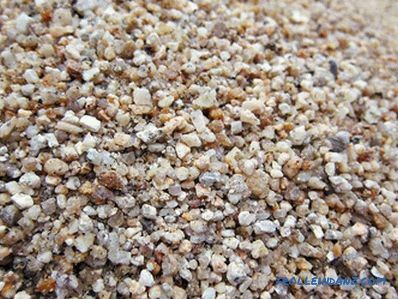 sand of increased particle size, the size of the granules is from 3 mm to 3.5 mm. It is better to use sand of such fraction for a pillow of the base under the construction basis. 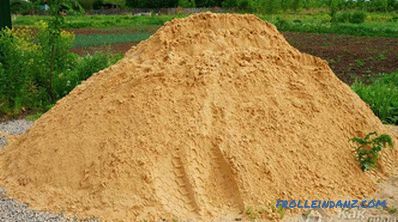 Very coarse sand, more than 3.5 mm in size, can also be used for foundation pillows. Another important point when choosing sand for the foundation is humidity. The water content in the sand plays an important role, since its amount must be taken into account when the solution is mixed with the addition of water. The recommended moisture content of sand for the foundation should be no more than 5%. Dried rock can have 1% moisture. If the sand came under precipitation, then its humidity can reach up to 10%. If you purchased sand, you need to take care of its protection from precipitation. To do this, you need something to cover or unload under a canopy. Then it will not absorb excess water. The humidity of your sand is 7%. There is another method for determining humidity. Simply use a special device that will show the exact figure. sand, the humidity of which does not exceed 5%. When buying such building materials for the foundation, you must pay attention to these indicators. The best option for price and quality is washed and sifted pit sand, granule size of 2-2.5 mm. It is better to buy it directly in the place of mining. If you have money and want your foundation to be strong and stand for a very long time, stop at the river sand of the same faction. Then your concrete under the foundation will have the necessary qualities. 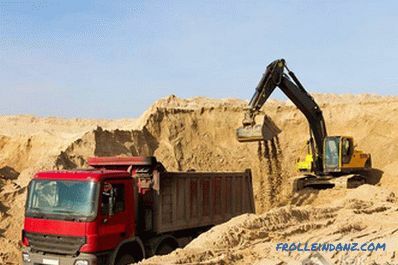 When buying sand, you should control the process of weighing the loaded and empty dump truck, as there are unscrupulous suppliers who underweight the sand, profiting from you. We hope that this article has helped you figure out what kind of sand to choose for the foundation. Manufacturing formwork for the foundation.